Don’t overlook the sake at this ramen and sake bar — there’s a sake master at the helm and some delicious small batch sakes to taste. Learn what you can about the fermented rice drink, and eat some tasty ramen, sushi, and crisp rice fried chicken karaage to put some food in your belly so you can drink some more. 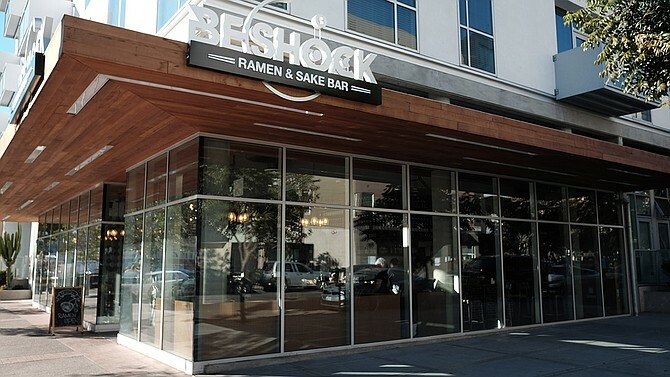 Monday 3-6pm: $3 Sapporo draft, $4 well drinks, $5 sake, $6 cocktails, $7 glass house wine. $3 edamame, $3 Beshock buns, $4 garlic edamame, $5 salmon skin roll, pork taco, $6 fried calamari, $7 roasted mussels. Tuesday 3-6pm: $3 Sapporo draft, $4 well drinks, $4 and $5 sake, $6 cocktails, $7 house wine, $3 edamame, $3 Beshock buns, $4 garlic edamame, $5 salmon skin roll, $6 roasted brussels sprouts, $7 fried calamari, roasted mussels. Wednesday 3-6pm: $3 Sapporo draft, $4 well drinks, $4 and $5 sake, $6 cocktails, $7 house wine, $3 edamame, $3 Beshock buns, $4 garlic edamame, $5 salmon skin roll, $6 roasted brussels sprouts, $7 fried calamari, roasted mussels. Thursday 3-6pm: $3 Sapporo draft, $4 well drinks, $4 and $5 sake, $6 cocktails, $7 house wine, $3 edamame, $3 Beshock buns, $4 garlic edamame, $5 salmon skin roll, $6 roasted brussels sprouts, $7 fried calamari, roasted mussels. Friday 3-6pm: $3 Sapporo draft, $4 well drinks, $4 and $5 sake, $6 cocktails, $7 house wine, $3 edamame, $3 Beshock buns, $4 garlic edamame, $5 salmon skin roll, $6 roasted brussels sprouts, $7 fried calamari, roasted mussels.